R (OAO Harris) v London Borough of Islington. High Court (Admin) CO/1282/2019 (unreported, settled March 2019.). This is a settled judicial review, I’ve seen the grounds, interim order and final consent order. It raises a number of issues about the performance of the new Housing Act 1996 Part VII duties as amended by the Homelessness Reduction Act 2017. The judicial review was of two decisions by Islington following a homeless application by Mr Harris. Mr H had been accommodated in a supported studio flat by St Mungos between 2012 and 2016. He has congenital hip dysplasia and had both hips replaced over 20 years ago. The right hip replacement has deteriorated and is to be replaced again. He had sepsis in the right hip. Mr H also has a dog, Lola, to whom he is very attached (this will become relevant). Mr H’s occupation of the studio flat became difficult when his ESA claim was terminated on the DWP finding him fit for work, and with it his housing benefit. Mr H did not want to claim JSA as he did not believe he was fit and able to work. Mr H says that no-one advised him that the ESA decision could be appealed. The rent arrears ended with St Mungos evicting him. Mr H became street homeless. Mr H applied to Islington in December 2016, but not application was taken (!). In November 2018, after two years on the streets, Mr H applied to LB Camden. Camden arranged for accommodation in a St Mungo’s shelter (supposedly for 72 hours, but he remained there for two months). In December 2018, Camden referred Mr H’s application to Islington, and again in January, when the hostel had given him notice to quit. Islington placed Mr H in temporary accommodation under s.188(1), but refused to allow him to have his dog with him, which was eventually put into the care of Dogs On The Streets, a charity. Islington obtained medical information and a NowMedical opinion. Mr H was moved to temporary accommodation in Brent, again without his dog. 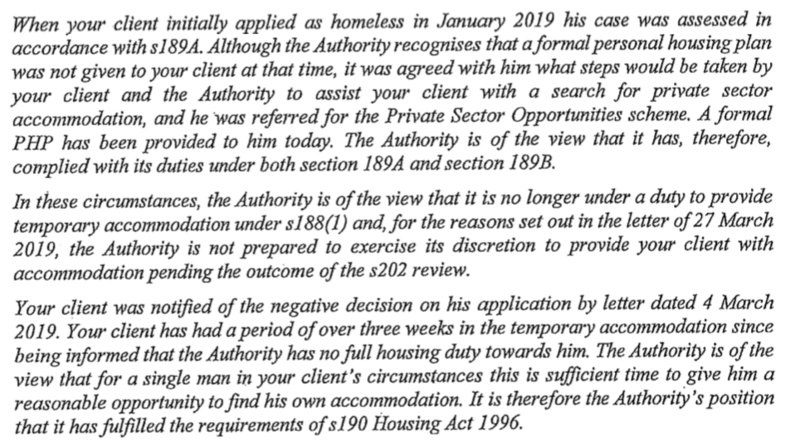 In March 2019, Islington served what purported to be a section 184 decision, finding Mr H was homeless and in priority need, but intentionally homeless from the St Mungo’s supported accommodation in 2016.The letter stated that Islington ‘must help’ Mr H in his ‘search for alternative accommodation’ (presumably referencing the s.190(2) duty to the intentionally homeless) and said Islington were cancelling his temporary accommodation in 14 days time. Mr H’s solicitors initially sought a s.202 review of that decision and requested continued accommodation under s.188(3) pending review. After a short extension, Islington said they would not provide accommodation pending review. This letter stated that no ‘Personal Housing Plan’ (PHP) had been provided to Mr H as he had not been able to attend an appointment. Mr H’s solicitors sent an urgent pre-action protocol letter on the basis that either Islington had not lawfully ended their duty under s,188(1) or alternatively, the s.190(2) duty had not been lawfully ended (as explained below). The letter noted that no PHP had been provided, nor any discharge of s.189B duty, and requested an extension of Mr H’s temporary accommodation. Islington then failed to provide a copy of the PHP, or of any written notice determining s.189B duty. The judicial review was issued with an application for interim relief. The s.189A Housing Act 1996 (as amended) duty to provide a personalised housing plan had not been complied with. This, and the following s.189B duty to ‘help to secure’ accommodation for a period of 56 days, were necessary precursors to any ‘final’ duties. The council was required to provide notice in writing, complying with s.184, in relation to both its decision as to whether s.189A and s.189B duties are owed, and also its decision as to which of the final duties (if any) are owed (s.188(1ZB) ). Further, the s.190 duty to the intentionally homeless did not commence until the s.189B(2) duty had come to an end, (see s.190(1)(c)), and, in considering advice and assistance under s.190, regard must be had to the PHP and assessment under s.189A (see s.190(4)). (b) the authority notifying the applicant of their decision as to what other duty (if any) they owe to the applicant under the following provisions of this Part upon the duty under section 189B(2) coming to an end. In this case, it was clear that the s.189B(2) had not come to an end. The mere effluxion of time – the 56 days – did not end the duty. The authority must still decide to end the duty and must give notice (s.189B(5) and (6)), including notifying the applicant of their right to seek a review. This had not been done, so the duty was not ended. Further, s.189B(7)(b) requires that the authority has complied with its duty under s.189B(2) for the 56 day period, and that requires having regard to the assessment of the applicant’s case under s.189. So unless the assessment of the applicant’s case (and thus the PHP) has been produced and notified to the applicant in writing, the authority cannot be complying with its s.189B duty. There was also a duty to notify the applicant that the s.189B duty had arisen, under s.184. Alternatively, even if the s.190(2) duty had arisen, Islington had not given adequate consideration to Mr H’s circumstances in order to give him ‘a reasonable opportunity of securing accommodation’. The High Court granted interim relief for temporary accommodation and said there was a clear prima facie case for judicial review. By consent, the claim and interim relief order dismissed, with costs to Mr H.
I have been a bit surprised that cases about the performance of the Homelessness Reduction Act duties have not come up before. It may well be that they have been settled, as this one was. I very much doubt that this will be the last. This one, though, makes the clear argument (and I think rightly) that the HRA duties are both sequential and cumulative. So, for example, a council might be able to discharge a s.189B duty and issue a negative s.184 decision at the same time, but it can’t lawfully do so unless it has carried out the s.189A duty, including assessment and provision of the personal housing plan, beforehand. It is also surely right that where the Housing Act 1996 as amended requires written notice of a) duties owed and b) termination of duties, those cannot simply be skipped or assumed to be wrapped into an ‘overall’ decision on duties under s.184. Our grateful thanks to Sioned Roberts of Hodge Jones & Allen for information on the case. Posted in Homeless, Housing law - All and tagged homelessness reduction act, s.189B. But what of the dog, Lola? Still in the care of Dogs On The Streets, I believe.